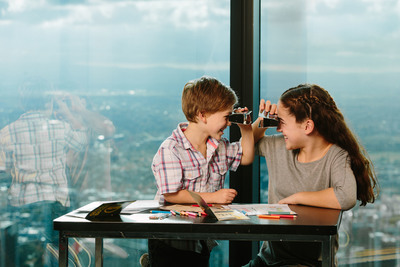 Set your sights high in the sky in the Summer school holidays, and enjoy Melbourne with the view from Eureka Skydeck. Eureka Skydeck is a place you simply must visit at least once. The Skydeck platform, sitting 88 stories above ground, is not only the highest vantage point in Melbourne, but is the tallest building in the Southern Hemisphere. Take in 360 degree views of Melbourne looking out from Eureka Skydeck's floor to ceiling windows, and if you're brave enough, head out to The Edge; a 3m by 3m transparent glass cube which slides out from the building, suspending you above the city's skyline. This summer also introduces a new experience to Melbourne's Eureka Skydeck; The Heist. Skydeck's newest high-tech experience allows you to take in the best views of Melbourne, while guiding your team of 'master thieves' through a diamond heist! Open from 10am to 10pm every day during the summer, and 10am to 5pm on Christmas Day and New Years Eve. Enjoy Summer in the Sky and take in the best views of Melbourne at Eureka Skydeck in the holidays.